This lovely, thought-provoking little book for young children opens the door onto an exploration of the symbol of our UU faith. It invites a look at what happens when the symbols of cup and flame are put together, and what the flaming chalice might mean when we bring it into our faith communities and into our homes. This is a book that children can take to heart. They can also personalize it by coloring in the illustrations. Parents and religious educators will appreciate the brief history of the chalice at the back. Kindly share with us your light. De Anna Hoyle, Director of Lifespan Religious Exploration at the Unitarian Church of Los Alamos has developed a unique "Coming of Age" program for Cup of Light. "I am using it for our new chalice lighter program for our 3rd graders, as a milestone and a coming of age, so to speak. Each child will get a copy of the book, learn about the history of the Chalice, learn to light our church's chalice and write chalice lighting words. They will then be able to sign up to light the chalice during Sunday worship." De Anna then prints certificates for each "graduate" of her Cup of Light program, marking the occasion for the children and their families. 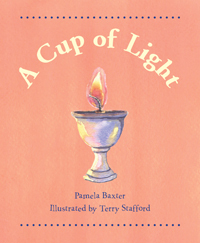 We'd love to hear how you use Cup of Light or other books from the UUA Bookstore in your congregation. Drop us a line by clicking here.